This is already Thursday and it’s time I get this column written. Today, July 30, is nephew Steven’s eighth birthday so happy birthday wishes go to him! It seems like the days are flying by. Tomorrow in two weeks is the wedding for Timothy and daughter Elizabeth. I ordered 350 pounds of chicken this morning for that day. Joe’s cousin will grill it for us on the morning of the wedding. Last week we attended the wedding of niece Katie Edna and Ben. They had a very nice day for their wedding. All of Joe’s siblings were there except for one of his brothers. There are twelve siblings so it was nice that most could be there. Hopefully all of them will be able to make it here for Elizabeth’s wedding. We arrived back home at midnight from the wedding and we had to get up a little after 3:00 a.m. for Joe to go to work. I could go back to bed but Joe had a rough day and was glad to see Friday evening come. 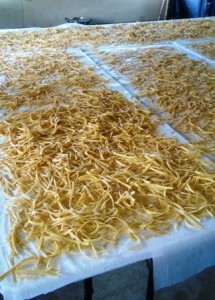 Oodles of noodles — Amish style. These are made and dried to be cooked and served at the wedding of Elizabeth and Time. Yesterday Timothy’s parents, sisters, sister-in-law and some of their children, my sisters Verena, Susan, Emma, and Emma’s children Emma and Steven, came to help us. They made noodles using well over 200 eggs. We saved the egg whites and put them in bags in the freezer—which will be used to make angel food cakes for the wedding. The helpers washed all the dishes in both my cupboards and corner cupboard. Some went out to work in the garden and finished weeding and tilling most of it. The younger girls washed off the outside porch and railings. So much was accomplished! Everyone brought something for lunch so I didn’t have to take time to make lunch. 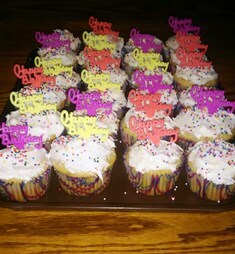 Son Joseph was not forgotten amid the wedding preparations: colorful cupcakes for his birthday! I painted the new closet that Joe put in for me in our bedroom. Joe put in a new floor and brother-in-law Jacob hung the doors and trim. Now today I’m excited to be able to fill it and I know that won’t take long. I also want to wash off walls and ceilings in our bedroom today. The girls are washing clothes. Joseph, 13, has been going with Benjamin, 16, every day to help Mose at his sawmill. Mose’s brother Freeman injured his leg so he needed help stacking wood. I still haven’t sewn my dress for the wedding. I have it cut out already. My goal is to work on it tomorrow. It seems I keep pushing it off every week, and I need to sew it before I can’t concentrate on it. Most of the other sewing is done, thanks to Elizabeth. Church services will be held here a little over a week after the wedding. We will have it in the pole barn where we will have the tables for the wedding. What a relief it will be when all of it is over. We hope tomorrow will be a nice day for Lyle and Leah. I saw them in town one evening this week. I told them I’m not sure if we will make it to their wedding as Joe is having a hard time taking more days off from the factory. They said if we can’t make it for the wedding, we can come for supper, so we will see if we can make it. Appreciate the invitation! Try this chicken noodle casserole. God’s blessings to all! In a large saucepan blend soup and sour cream. Cook together for 5 minutes. Add remaining ingredients. Heat; stir occasionally. Can serve immediately. Makes 10 cups. If frozen, place in covered casserole in cold oven. Bake at 400 degrees for 1 hour and 15 minutes. Previous PostA whirlwind of cleaning and more precedes a home Amish weddingNext PostLovina’s diary, one week and two days before wedding!